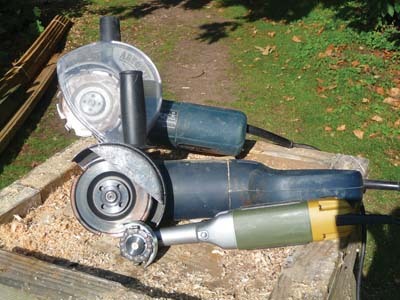 There is a range of Arbortech cutters available. 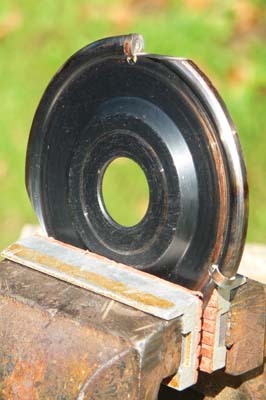 Most fit onto a 100mm or 115mm angle grinder. Depending on the material to be cut, there is a choice of edge materials, usually steel as in the original cutters, or tungsten toothed versions more recently on the market. 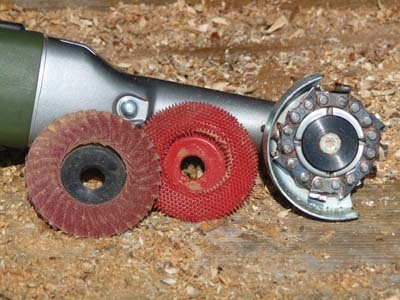 The smallest cutters can be used on a rig that fits an angle grinder, or can be fitted to a Proxxon die grinder body. It is essential to follow safe practices, so use eye protection (face shield), dust mask and perhaps ear defenders if a long session of work is envisaged. I also recommend stout gloves as high-speed wood chips can sting, a good jacket such as a woodworker's smock, and stout shoes or boots. I make it a personal rule that I always have both hands holding the angle grinder when it is running, and never put the tool down until the blade has completely stopped rotating. In my experience, accidents are most likely to happen when concentration is relaxed just as a job is finished. 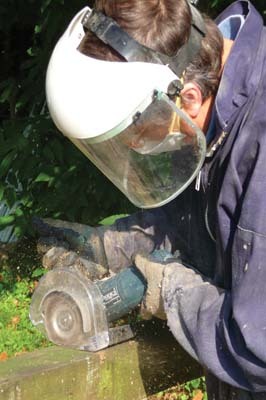 The Arbortech has a transparent guard which allows only the teeth cutting the wood to be exposed. It also doubles as a depth stop, allowing cuts of a set depth to be made, which gives great control over the depth of cut. 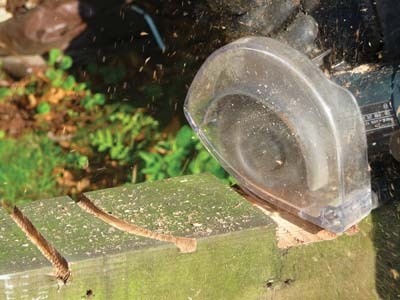 The guard does restrict accessibility when the cutting face becomes deeper into the timber. Cuts can be made straight or curved and also from side to side, giving a hollow section that can be made progressively deeper. 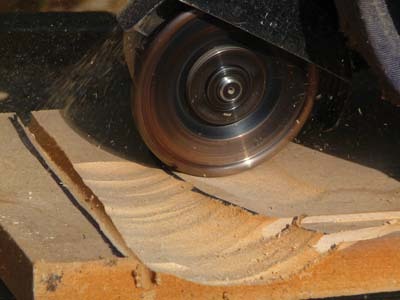 The amount of blade projecting - with or without the plastic guard - and the bulk of the angle grinder body will have an effect on the amount of timber removed. The tungsten tipped model, although possibly not quite so clean cutting on green wood, is excellent on ply and other glue-based industrial materials, and will keep its edge for ages. It is not sharpened as such but when the circular cutters become dull in one spot, they can be rotated by slackening a central set screw, bringing a new sharp edge into action. It is essential that the work is held securely with cramps or screws, and either wood or steel braces - which must be well clear of the cutting area. 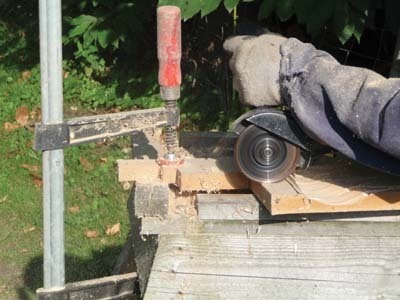 While setting up the material to be cut, it is important to check timber for foreign objects such as embedded nails, wire and even stones, especially in garden sourced timber. One clue to the presence of these unwelcome items are dark stains caused by the tannic acid of the timber reacting with the embedded metal. 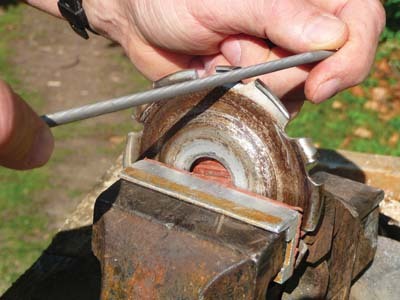 The small version of the Arbortech can be fitted to a Proxxon die grinder as in the picture, or onto a special rig on an angle grinder. This lightweight version is excellent for small carving jobs and also for final shaping on large projects. Again, it is essential to have the workpiece firmly anchored, and for both hands to be holding the tool when it is running. 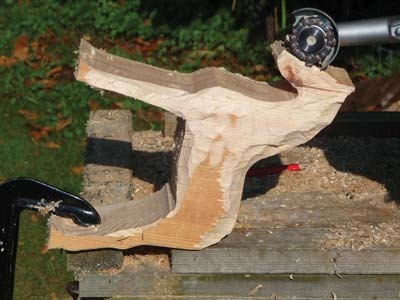 The cut surface of the timber after using the small Arbortech can be simply finished with woodcarving chisels, or there are other attachments that fit the die grinder, such as tungsten toothed burrs and various sanding discs that will give a good finish to the work. 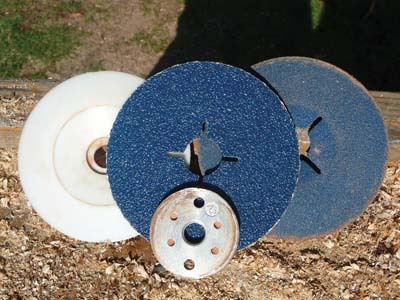 Once the bulk of timber is removed with the Arbortech, the surface of the timber can be tidied up using heavy-duty sanding discs with a plastic backing disc fitted to the angle grinder. On materials such as plywood or MDF, the glue element of these products will destroy the edge of woodcarving chisels very quickly.